1. Perform a light manicure, including applying cuticle remover on the cuticles. 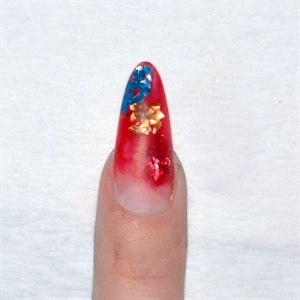 After the cuticle gets soft, remove it carefully. Wash your client’s hands. Use an Entity 150-grit file to shape the free edge and level the nail surface if it is rough or uneven. 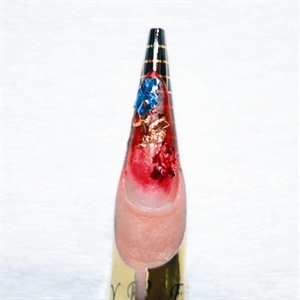 Slightly file off the glossy layer of the nail with an Entity Perfect 100/180-grit file board and clean the nails with a nail brush. Apply a form. 2. 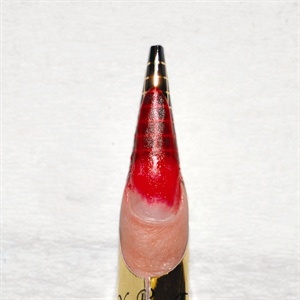 Use Entity non-acid primer, and then sculpt a thin layer of red acrylic down toward the tip of the form. 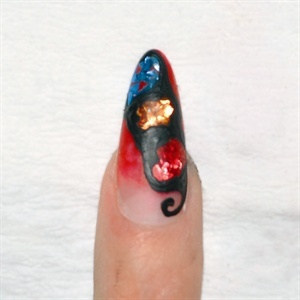 Decorate the nail with pieces of colorful foil to make an imaginary curvy line. 3. 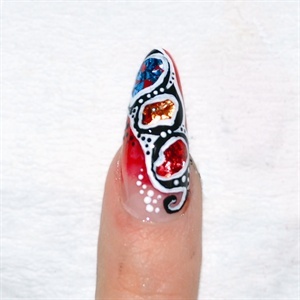 Try to inlay foil in different directions on each nail to make the design more original. 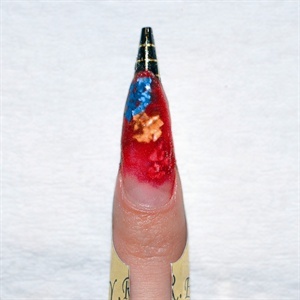 Cover the nail with Entity clear sculpting acrylic, making sure to fully encase the foil you’ve added. 4. Buff with the Entity buffer 220/280-grit for a nice polished look. 5. Outline the shaped foil pieces with black acrylic paint. 6. Use white acrylic paint to highlight the outer edge of the black line and the insides of the sparkly areas to make it look like embedded stones. Add black and white dots to the ­design. Apply two layers of UV top coat to protect the nails from ­yellowing and to make them shiny.